A good belt does a lot more than simply keep your pants up and when you wear an Urban Carry Holsters belt, you are getting the finest heavy duty gun belt available. These belts provide magnificent craftsmanship, increased tensile strength, comfortable fit and modular compatibility every time you wear them. These duty holster belts are stylish enough to wear with casual attire, but strong enough to carry and handle the weight of your concealed weapon and gun holster. 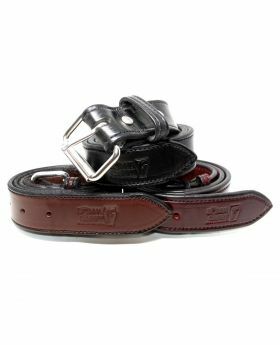 Proudly made in the USA, these English Bridle Leather belts provide a stable and secure platform for all different types of duty equipment that includes your leather gun holsters, magazine pouches and other vital equipment. These firearm belts offer a comfortable and hands free carry all day long for a complete load of various equipment. While designing our gun belts, our designers take care to come up with designs that are perfect to handle the weight of a gun holster, and ergonomically suitable as well. Our leather belts reduce lower back fatigue and chance of injury by decreasing strain on the lower back. Moreover, while manufacturing our firearm belts, we keep a sharp eye on the density, thickness and strength so that the belt doesn’t roll over or tear apart in just a few weeks due to the load of equipment. Our gun belts offer you a perfect combination of fit and functionality that you expect from a heavy-duty belt.